It is fall in Ankara. The days are warm, the nights are cool. The weather is lovely. The leaves are starting to change-sort of. I think it is because it is not quite cold enough that the leaves are changing color patchily. The colors are not particularly vibrant. But after living in California for three years, a little yellow on the trees and leaves on the ground feels like autumn to me. However, my conception of autumn and foliage has been forever ruined by the standard. Nothing can ever come close. Seriously. My parents have ruined me for fall anywhere other than New Hampshire. 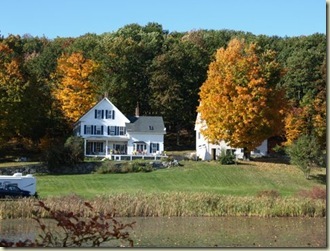 In the fall our home is surrounded by brightly colored trees. In front of our home is a pond, and when the light is right the trees across the pond reflect on the water and it looks like they might catch on fire. Really. There is no comparison. I receive photos very similar but very different several times a week. 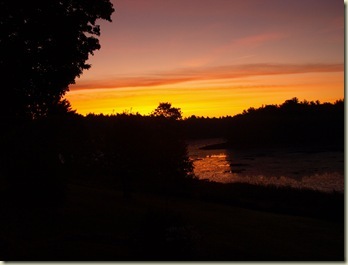 This is the view off the front porch at sunrise. 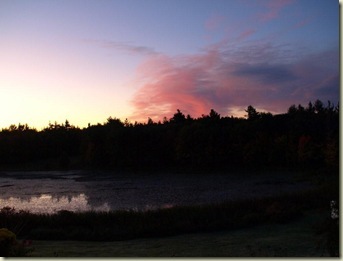 My mother sends me sunrise photos from home about three times a week. They are my favorite emails to find in my inbox. 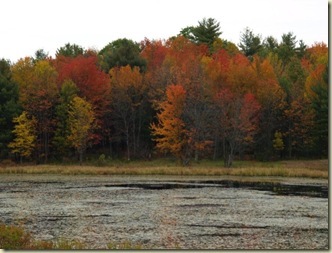 This entry was posted in Expat, Fall, Foliage, Home, NH and tagged Expat, Turkey by Jules. Bookmark the permalink. You are the perfect child!